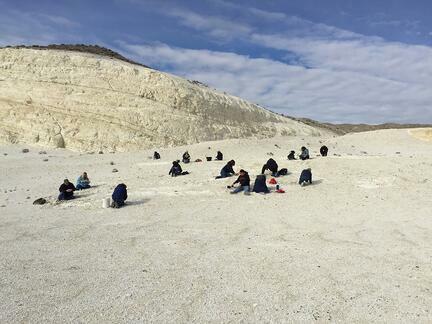 Last year, 48 teachers from Lyon and Churchill Counties in Northern Nevada took a grant-supported graduate-level, for-credit course called Earth Systems Matter, at the EP Minerals Hazen, Nevada diatomaceous earth (DE) mine. This was no ordinary tour, mind you. Not only did the teachers learn about the history and geology of DE (from Mine & Exploration Manager Skylar Burdette,) they also got to dig for 10 million year old stickleback fish fossils. EP regularly offers this class to Nevada teachers- it’s critical that teachers go back to their classrooms and teach their students about the importance of mining and minerals in our lives. The course is designed to enhance the Science, Technology, Engineering, and Math (STEM) skills of teachers in Lyon County, primarily so they can expose their students to geology, mining and minerals. Collecting stickleback fish fossils adds to their science standards and is just plain fun. 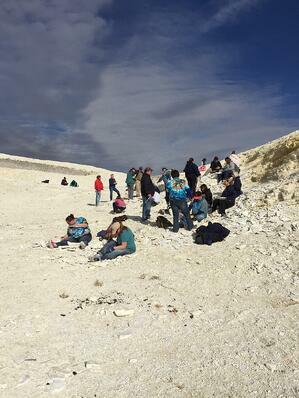 Here are a few snippets from the course handout and some great photos of the teachers digging for fossils at the mine. EP Minerals diatomite mine near Hazen, NV, is where Late Miocene (9-10 million year old) stickleback fish (Gasterosteus doryssus) fossils are abundant within the layered diatomite sedimentary rocks and may be collected with some perseverance and good luck! Every piece of rock you pick up here rock here contains thousands, even millions, of fossils since diatomite itself is composed of the fossilized skeletal remains of diatoms. Diatoms are microscopic planktonic creatures that inhabited a lake that existed here between 9 and 10 million years ago in a narrow north-south-trending fault-bounded basin, one of many that were forming in northwestern Nevada at the time, as the Basin-and-Range topography of Nevada was beginning to take shape. These lakes often hosted different species of diatoms in different lakes, for although close to each other, they did not connect like the later and much more extensive Lake Lahontan. Continuous and repeated faulting along the adjacent mountain ranges caused these basins to deepen over time and nearby volcanism provided an ample supply of silicic ash to the lakes for the diatoms to use in building their silicic tests (shells). Some diatomaceous layers are even interspersed with layers of volcanic ash. Climatic conditions were wetter than today and the lake persisted for several million years. Two fish species are very abundant but usually occur separately: one is the killifish, Fundulus nevadensis, and the other is the stickleback, Gasterosteus doryssus. 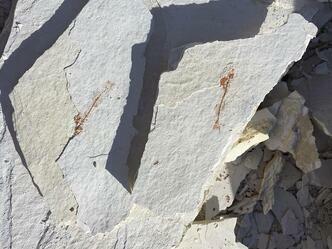 Most Nevada diatomites are overwhelmingly composed of one species, Melosira. In its simplest form, the Melosira resembles (in miniature) straight barrels stacked one on top of another, each "barrel" was a single diatom. The principal uses of diatomite is as filtration media to process liquids such as water, wine, and chemicals; as a functional filler in products such as paint plastics, rubber, and insecticides, as absorbent for cat litter and floor dry, and as a source of silica in calcium and other silicates. The US is the world’s biggest producer of diatomite and Nevada is one of the top diatomite-producing states. Nevada produces hundreds of thousands of tons of diatomite annually, about a third of US production. EP is the top–producing company in the state and the one of the leading diatomite producing company in the world. 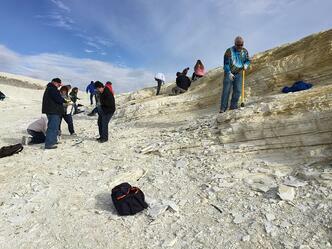 EP Minerals has been actively producing diatomite in Nevada since the 1950s. We always make sure that all the teachers leave with teaching materials about diatomaceous earth, and a big sack of DE rocks. It's the best field trip around!